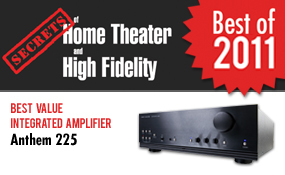 Anthem® Electronics Blog | News & Updates: Anthem cleans up with not 1, not 2, but 3 awards from Secrets of Home Theater's "Best of 2011"
Anthem cleans up with not 1, not 2, but 3 awards from Secrets of Home Theater's "Best of 2011"
Anthem Integrated 225 wins "Best Value Integrated Amplifier"
Anthem MRX 500 wins "Best Mid Priced AVR: Audio and Arc"
"Best Advanced Room Correction Firmware"
Click here! to see the full list of winners. 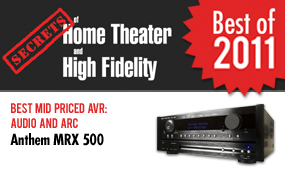 Anthem MRX 700 wins 2011 Best A/V Receiver!